Modern technology has given us a vast number of tools that help us improve our golf swings. Tour pros use full-motion capture suits to recreate their swings on computers (and in video games). Golf schools use sophisticated analysis software to draw planes and arcs on video. Even an amateur can buy a cheap video camera and make videos good enough to spot flaws in technique. But all you really need is a half-length wall mirror to help you improve your swing – even if it's too cold to go outside. Find a mirror at least 3 feet long and mount it on a wall if it is not already mounted. Although a full-length mirror allows you to see more of your body movement, a half-length mirror is good enough to help you improve. You want one that is at least as long as your upper body (head to waist). 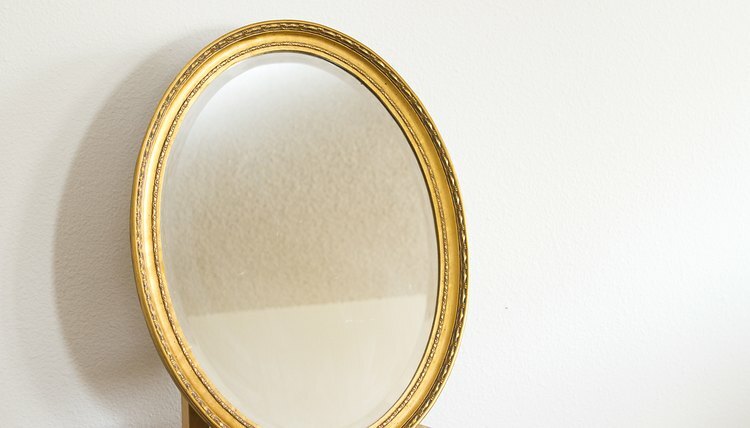 Place the mirror on the wall so that its bottom is about waist-high. Stand about 3 feet from the mirror. This is far enough away to let you see how your hips move, which will tell you what your legs are doing. 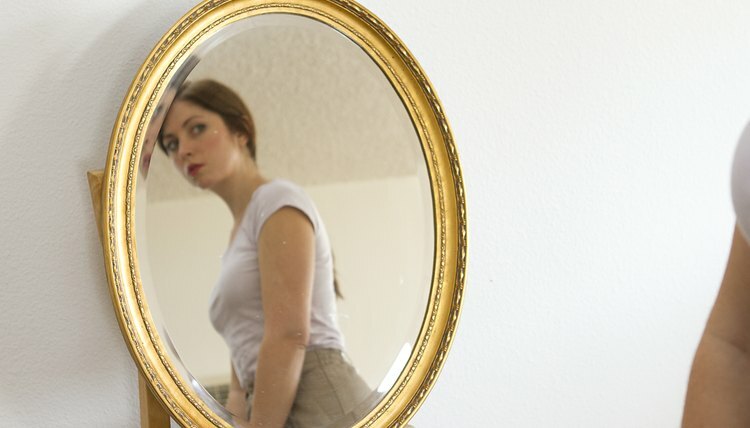 A half-length mirror can show your body from head to knees if the mirror is mounted at the right height. Obviously, a full-length mirror is even better because it will show your entire body. Grip an imaginary club. Working on your swing indoors can be dangerous when using a real club, but you need an authentic grip to get useful feedback. To recreate your grip without a club, hold your left hand out in front of you as if you were going to shake hands. Make a fist, then extend your left thumb straight up (a thumbs-up position). The thumb is your "shaft." Now take your regular grip with your right hand, using your left thumb as if it were the shaft. This will allow you to get both an accurate hand position and an accurate shoulder tilt when you take your address position. Face the mirror and take your address position. From here, you can easily "swing" your hands to any position in your backswing or downswing. This is especially useful for checking to make sure you don't have a sway or reverse pivot in your swing. Place a small piece of masking tape on the mirror to mark the center of your chest at address to help you keep track of this point. Remember that your breastbone will appear to move slightly backward during your backswing because your head rotates on your spine. To make a good shoulder turn, try to get your left shoulder to the tape without moving your chin to the right more than necessary. Turn so that your right side faces the mirror – a 90-degree turn from the previous position. From this new position, you can check your spine angle. Let your arms hang relaxed from your shoulders; your hands should be almost directly beneath your chin. If you stand too erect, your hands will stick out too far in front of you. You can also check your position at the top of the backswing. You should be able to see your right shoulder underneath your hands and between your forearms. Turn so that your left side faces the mirror. From here, you can check your finish position. Your belt buckle and chest should face the mirror.